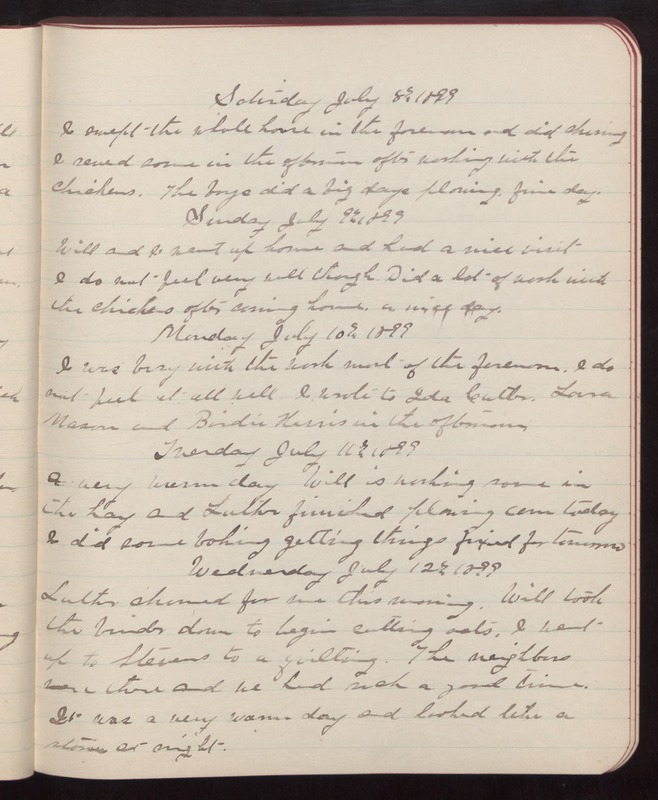 Saturday July 8th 1899 I swept the whole house in the forenoon and did churning I sewed some in the afternoon after working with the chickens. The boys did a big days plowing. fine day. Sunday July 9th 1899 Will and I went up home and had a nice visit I do not feel very well though. Did a lot of work with the chickens after coming home. a nice day. Monday July 10th 1899 I was busy with the work most of the forenoon. I do not feel at all well. I wrote to Ida Cutler. Laura Mason and Birdie Harris in the afternoon Tuesday July 11th 1899 A very warm day Will is working some in the hay and Luther finished plowing corn today I did some baking getting things fixed for tomorrow Wednesday July 12th 1899 Luther churned for me this morning. Will took the binder down to begin cutting oats. I went up to Stevens to a quilting. The neighbors were there and we had such a good time. It was a very warm day and looked like a storm at night.